In the Old Village, a family of Brooklyn transplants revives a historic abode with their youthful energy and vibrant art collection, which includes the likes of this mid-century floral painting scored at High Point Market. 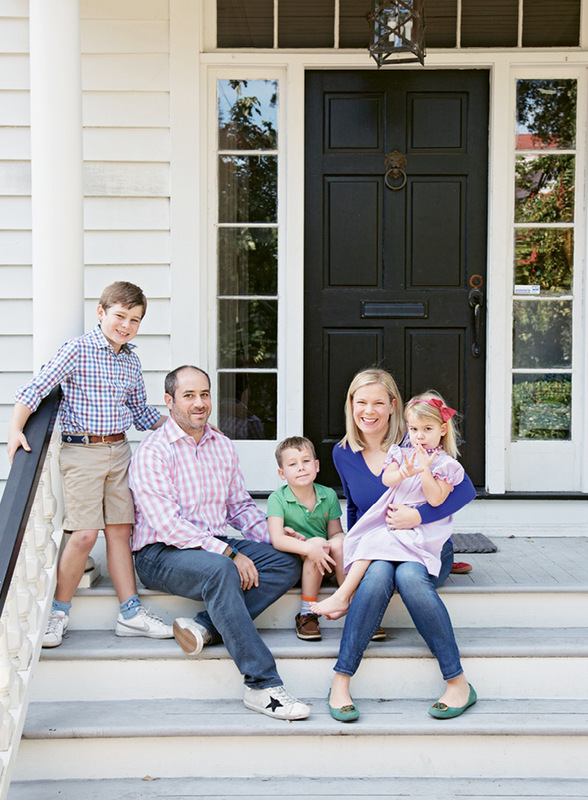 Full house: The Rosen family, with help from designer Jenny Keenan, brought youthful energy to this 19th-century Old Village abode. 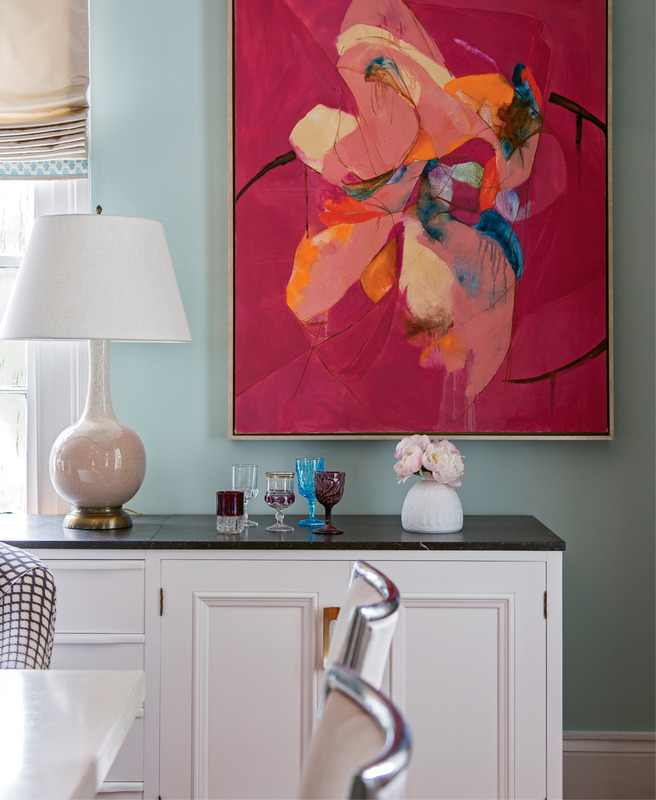 BALANCING ACT: In the formal dining room, a sleek concrete table and chrome-edged chairs ground sea-green walls and colorful artwork, such as this framed textile scored at High Point Market (top) and painting by area artist Linda Elksnin (bottom). 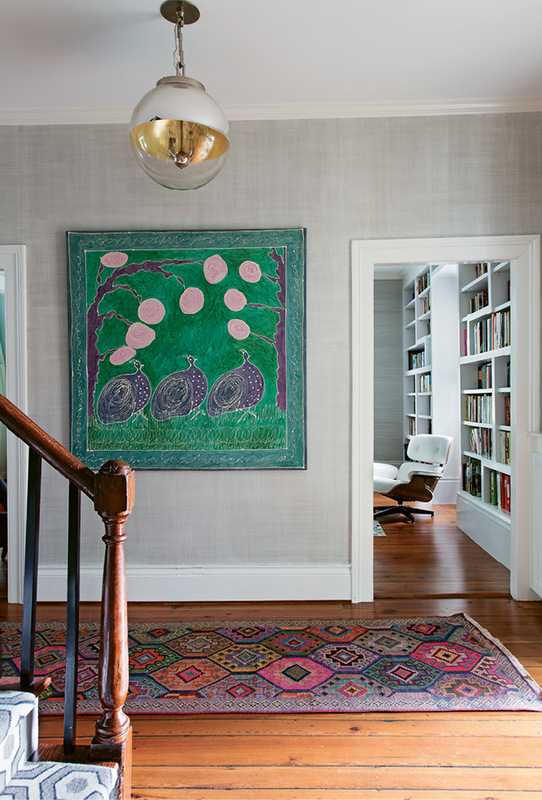 BOLD ACCENTS: Grasscloth wallpaper provides a neutral backdrop for the foyer’s bright silk painting and two patterned rugs. OPEN dialogue: The Rosens knocked down a wall in an existing addition and brought in a structural support beam to create one open space for cooking, dining, and lounging. A Molly B. 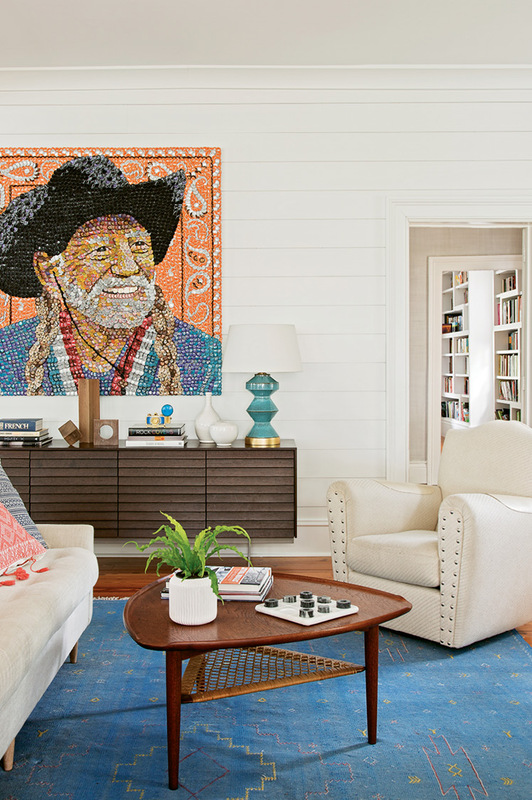 Right portrait of Willie Nelson—dubbed “Bottlecap Willie” by Sam-—presides over the scene. IN THE SPOTLIGHT: Sculptural light fixtures, such as this hand-blown glass number by John Pomp, were added throughout. “They’re really like works of art,” Melanie notes. Cloth dolls collected by Melanie’s late mother during her travels in Africa now decorate four-year-old Addie’s bedroom. BEAM ME UP: During the renovation, the Rosens discovered old wood ceiling beams in the kids’ bathroom. “We thought they were so wonderful, we left them exposed,” says Melanie. From the outside looking in, Melanie and Sam Rosen’s circa-1865 abode—with its trim boxwood border, stately columns, and double front piazzas—is the picture of traditional Old Village. Step one foot through the front door, though, and you’ll immediately see signs that a very modern family makes its happy home here. You might spot nine-year-old Ben and a playmate from next door zipping around the corner, with Henry, age seven, and Addie, four, hot on their heels. “We want our house to be beautiful, but we also need it to be usable and functional,” says Melanie. “There would never be a room roped off where little ones aren’t allowed to go.” The historic property’s playful interiors—outfitted with help from area designer Jenny Keenan—seem to bubble over with lively colors and patterns, underscoring this kid-friendly philosophy. entryway, were inherited from Melanie’s mother, who also worked in the nonprofit sector on an international scale, serving as director for the Africa-America Institute—a gig that took her to nearly every country on the continent. But in 2013, when Sam’s boss gave him the go-ahead to work remotely (he’s in commercial real-estate finance), that timeline accelerated. Melanie’s gig as a freelance writer was also transportable, so with nothing holding them back, the two decided to take the plunge. One lucky real-estate-scouting trip later, they were holding keys to the Old Village gem. They loved the classic architecture, quiet neighborhood, and proximity to the water. But the house needed some work: the couple hoped to open up the floor plan of an existing addition, update the fixtures and finishes to reflect their modern taste, and fill it with furnishings and décor to echo their family’s youthful energy. Enter designer Jenny Keenan. “The fact that she has two young kids made me think she’d understand the needs of our family,” Melanie says. 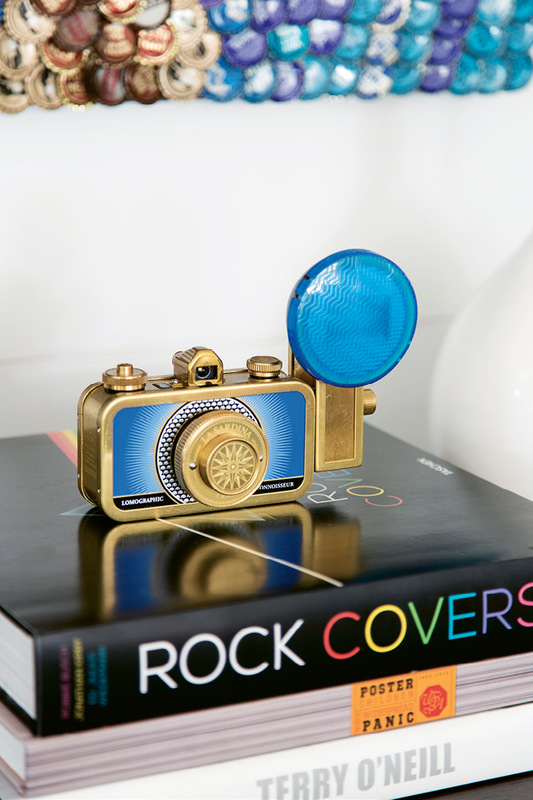 Plus, Keenan’s portfolio brimmed with evidence of her knack with color and texture. “I absolutely love pattern, and we’ve played around with mixing and matching in our homes before, but we thought Jenny could help us take it even further,” she adds. The couple entrusted Keenan to oversee the project while they remained in Brooklyn. Keenan kicked things off by enlisting local firm Crawford Contracting and Consulting to knock down a wall in the rear addition, carving out an unobstructed cooking, dining, and lounge space tailored to the needs of a 21st-century family. 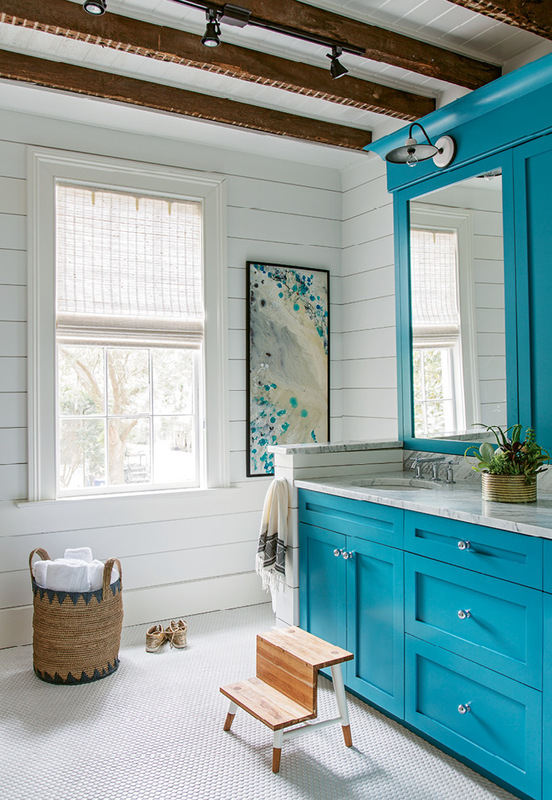 Next up, the designer spearheaded a gut rehab to give the traditional kitchen a fresh look. Post-reno, a blue-tile mosaic backsplash glitters in the sunlight, while oversized brass pendants and pebbled-mirror cabinet fronts cultivate a feeling of casual glamour. Earthy elements keep the scene grounded: open shelving stretches across two windows that overlook lush foliage, and mid-century walnut stools add warmth to clean-lined waterfall marble countertops. 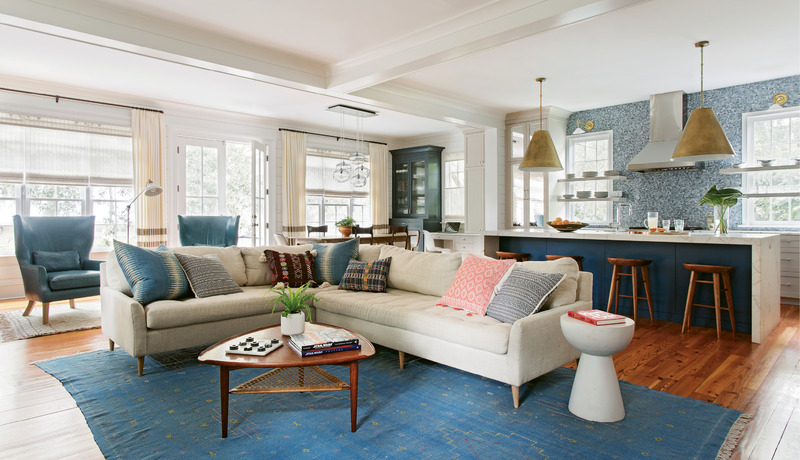 In the adjacent living room, a low-profile sofa from North Carolina furniture maker Verellen, a vintage rug, and pillows sewn from mix-and-match pattern textiles strike an eclectic note that’s chic but inviting. “This is where we spend the majority of our time,” says Melanie. “I cook almost every night, and I’m able to be part of the conversation.” This means that while the lady of the house is busy pulling a loaf of her signature challah bread out of the oven, she can still listen as Sam and the boys jam out to bluegrass music or take in an Arkansas football game on TV. untouched. 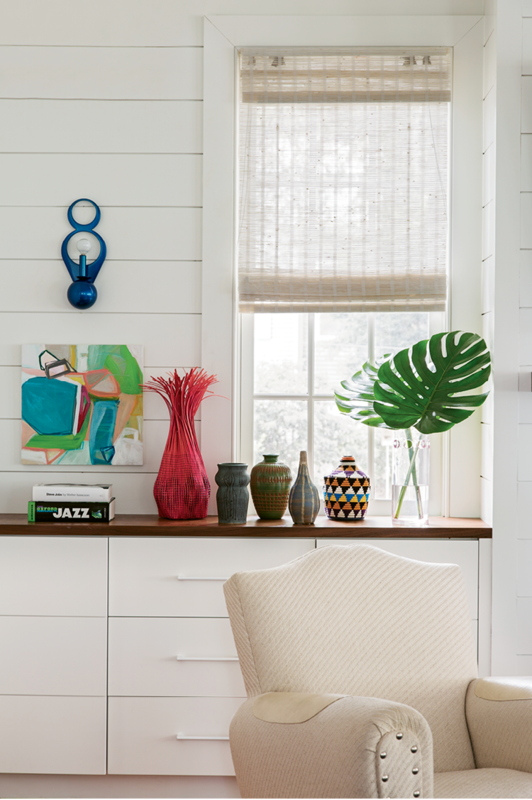 To connect this space with the 1980s addition, Keenan infused it with a similarly eclectic mix of furnishings—many of them from the mid-century, Sam’s favorite design era. 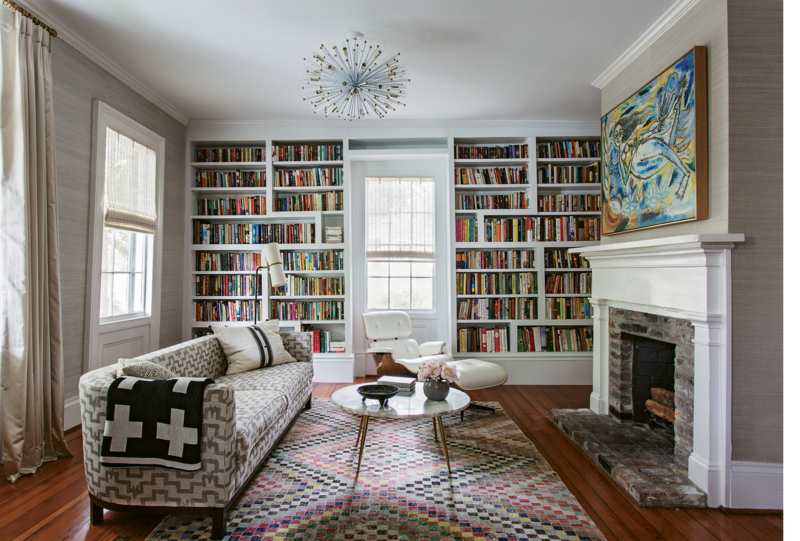 Vintage fabrics and rugs were another important part of the design strategy: “Those types of textiles make it feel more lived-in and not so perfect,” Keenan says. 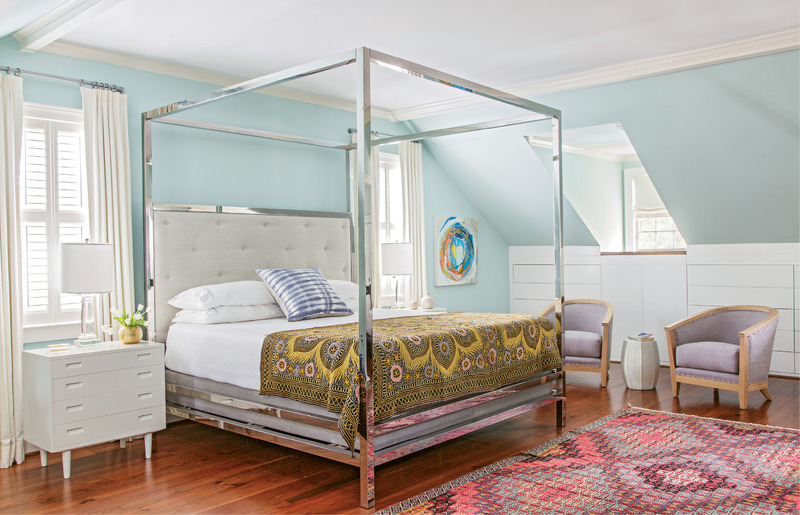 The resulting rooms show a masterful mix of old and new, with plenty of bright hues and geometric motifs thrown in for good measure. 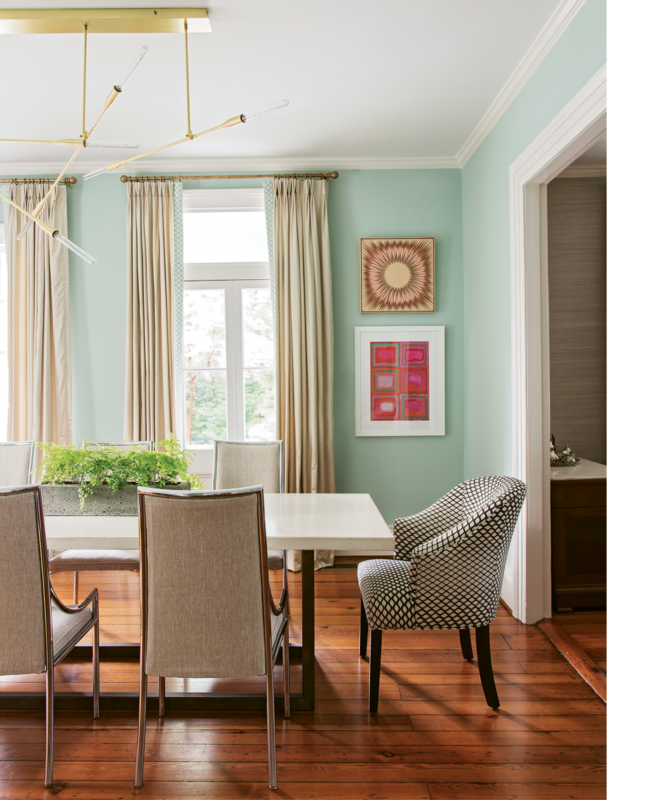 In the first-floor formal dining room, mid-century chrome chairs commingle with a contemporary concrete dining table and a Sorenthia Quad chandelier. The study boasts a vintage sofa Keenan scored on chairish.com, a multicolored rug, a white Eames chair chosen by Sam, and a Sputnik-inspired light fixture. For the project’s finishing touch, Melanie worked with Allison Williamson of the Charleston Artist Collective to source works to help her collection reflect her present as well as her past. “We wanted fresh, modern, and colorful pieces,” Melanie notes. Mission accomplished: the current chapter in her life is represented with vibrant paintings by local artists such as Way Way Allen and Emily Brown.